THE ANNEX at Seaside Beach: OCEAN FRONT is nestled on the edge of the sand dunes providing privacy and its own beach access. 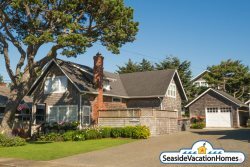 Just 50 feet from the north end of Seaside’s famous boardwalk, the Prom, sits this oceanfront home. At this location you can walk directly from the deck right to the sand dunes, ocean and beach. A ten-minute stroll will take you to the aquarium, Turnaround, downtown shops and restaurants. The two-story home is approximately 1800 square feet in size. The floor to ceiling picture windows and vaulted living room make it feel even bigger. A sun deck at the front of the home extends the living space outside. Two bedrooms and a bath are located on the main floor with one of the rooms furnished with a king bed and the other a queen. You can watch the activities on the beach from the living and dining rooms as well as the kitchen and upstairs loft. Expanded cable ensures you won't miss any of your favorite programs when watching the large screen television. Upstairs is a family room equipped with a TV/VCR, games and a foosball table. The large bedroom and bath on this floor has a queen bed and two twin beds to comfortably sleep four guests. A single car garage is available for parking but guests are limited to two cars on the premises. Keep in mind the additional cleaning charge ensures that your house will be spotless upon arrival and that you will not be asked to spend more than 5 min on the check out procedure. See policies for more booking information.